Drapery workroom pack. Economical, lightweight version of Thermalsuede, but not available in flame resistant. Perfect lining where climate control the room is absolutely necessary. Similar to Thermalsuede it's Velvetsuede finish. The coating adds stability to the cloth and eases handling"the workroom. SpecialSuede adds luxury and texture to the decorative drapery fabric it lines.# 70% Polyester/ 30% Cotton # available in White and Parchment # 54" (137 cm) width # With VelvetSuede Aerocellular Acrylic Foam Coating Filters Light Dry Cleanable Fabric Put up 100 yards. Made of vinyl coated fiberglass yarns. 14 percent openness factor makes this roman shade fabric perfect for windows that require more view. Comes in 72 and 96 inch wide fabric. Composition: 35 percent fiberglass, 65 percent vinyl on fiberglass. 31 percent polyester, 69 percent vinyl on polyester. Available in cut yardage or 30 yard bolts. This five channel system is an alternative treatment for verticals and drapes. Aluminum track finished in white. It is available in three, four and five channel configurations that can be combined for extra wide installations. Assembled sets include brackets, 36 inch fiberglass baton or cord, Velcro for top of panel, flat bar for bottom of panel and tension pulley. Add your fabric or use our Sheerweave fabric selection. Applications: Hand drawn one or two way, cord drawn. Can be spliced for wide installations. Wall mount or ceiling mount. Max weight, 10 pounds per panel. 525A2 Altus 500 Series (110 V AC) Torque 220 lb, Speed 20 RPM Rapid Limit Adjustment. Star head. Standard tubular motor. Super heavy duty window drapery rods. White finish. Projects 2 to 3 1/4,inner, and 5 to 6 1/2 inch on outer, clearance 1 1/4 to 2 1/2 innner, 4 1/2 to 5 3/4 on outer traverse rod. Includes cord tension pulley. Graber super heavy duty features include a universal front loading end bracket, metal adjustable and reversible master carriers ball bearing end pulleys, a spring loaded side gate for adding or removing slides, molded, canted slides, can be converted to one way draw, scored center support base for easy mounting on narrow casings, universal cam lock stirrup, braided polyester cord, and angled tip on overlap arm. Drapery double rods. Saunter curtain rod finial for 1 1/4" curtain rod. 24 hour quick ship program. This three channel system is an alternative treatment for verticals and drapes. Aluminum track finished in white. Sizes over 5 feet will have UPS oversize charges added. Sizes over 8 feet will have to be shipped by truck. 1 1/4 inch Paris Texas decorative metal curtain rod 8 feet long. Quick ship program. This four channel system is an alternative treatment for verticals and drapes. Aluminum track finished in white. It is available in three, four and five channel configurations that can be combined for extra wide installations. Assembled sets include brackets, 36 inch fiberglass baton or cord and tension pulley. Add your fabric or use our Sheerweave fabric selection. 10 per bag. Traverse slides by Kirsch for superfine and empire rods. 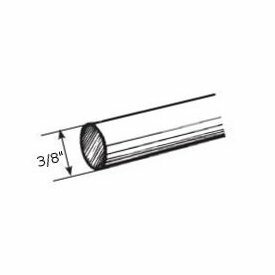 Select wood curtain rod pole 2 1/4" diameter, 16 feet long. Available in 4,6,8 and 12 foot lengths. Ten colors to select from plus unfinished. Base Price is for unfinished rods. Colors will show price in the cart. Note: Truck shipping only. Key finial for 1 inch metal poles. 5 inches long by 3 3/4 inches wide. Made of cast iron. Some colors are more than base price.